One half of the gold-medal winning team that produced Britain’s only Gold medal in Vancouver this year will feature on the University of Southampton's stand at the Goodwood Festival of Speed this weekend– albeit the strong and silent one. 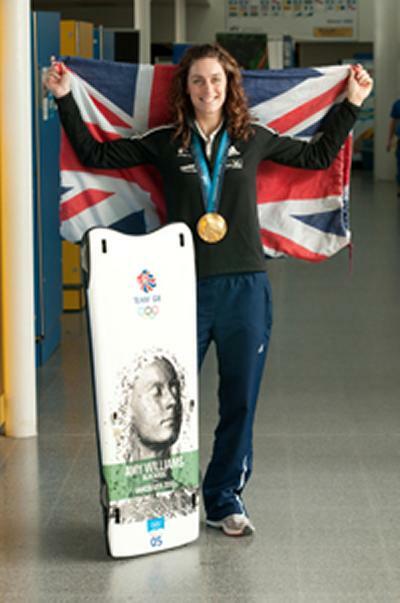 Arthur, gold medallist Amy Williams’ sled, was designed by University of Southampton doctorate research students James Roche and Rachel Blackburn. Rachel will be bringing Arthur to Goodwood on Saturday 3 July to talk about how he was designed and the science that went into his speed. There will be a replica of the real sled throughout the show so that children of all ages can see how Bob Skeleton athletes go down the fastest ice tracks in the world. The University of Southampton will be at the Goodwood Festival of Speed, which runs from 2 to 4 July, to showcase the ‘Science of Speed’ and how new innovations and cutting-edge engineering help sportsmen and women maximise their performance. There will be interactive displays demonstrating how race car wings work, a full-size aerodynamic model of an F1 car and information about the University’s world-class facilities, such as the RJ Mitchell wind tunnel and the Wolfson Unit for Marine Technology and Industrial Aerodynamics (WUMTIA), which have been used in a range of activities, from the development of America’s Cup and other racing yachts and the design of powered marine vessels, to improving air flow around structures and optimising drag and down force in race cars. The University is hosting a reunion for Southampton motorsport alumni at 2pm each day. If you want to find out how science and technology have come to underpin the world of sport, then visit the University of Southampton on stand 158 and find out about the Science of Speed at Goodwood.